Carnival Conquest Discounts: Cruises from $179 with a Best Price Guarantee. 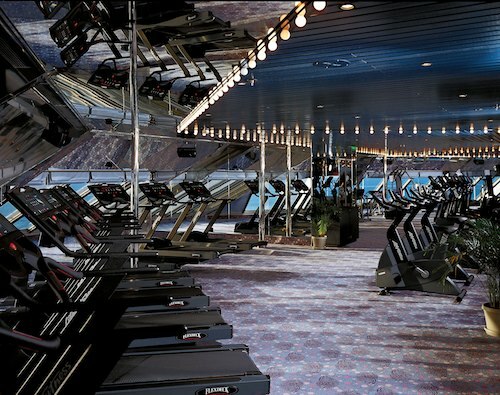 The Carnival Conquest jogging track and fitness center are both located on Deck 11 -- the Spa Deck. The Carnival Conquest offers gym facilities and an aerobics room forward on Spa Deck, and features weight lifting equipment, indoor cycling, and machines for your work out that can be safely described as "state-of-the-art!" While classes (such as in yoga and aerobics) and personal trainer services can be purchased, use of the gym facilities and equipment are at no extra charge. The Carnival Conquest jogging track is aft on Spa Deck (11), and is referred to as the Sports Deck. The Carnival Conquest fitness center is accessed via the Spa Carnival front desk. There is a hallway on the left and right side of the Spa Carnival check-in that leads to the Men's and Women's locker and shower area before entering the gym area itself. There are men's and women's locker rooms and showers you may use in the Spa Carnival facility. Aerobics and yoga classes are available on Carnival Conquest for a modest fee -- check the Fun Times or with the Spa Carnival front desk for scheduling information. We will e-mail when there is a change in price on this Carnival Conquest cruise. You can unsubscribe at any time. Carnival Conquest cruises from $179The latest deals and best discounts on all sailings. Take The TourThe Carnival Conquest Tour saves you time and money. Photos & VideosExclusive video tours and photo galleries of the Carnival Conquest. Best Cabins AdvisorExperts help you discover the best (and not so good) cabins on Carnival Conquest. Cabin Category GuideCarnival Conquest cabin category differences explained in plain english.